Based in San Francisco, Brass Over Bridges is an ensemble that understands that music is all about connection. Inspired by the artistic community of the San Francisco Bay Area, Brass Over Bridges seeks to engage audiences with music across barriers of style and artistic discipline. 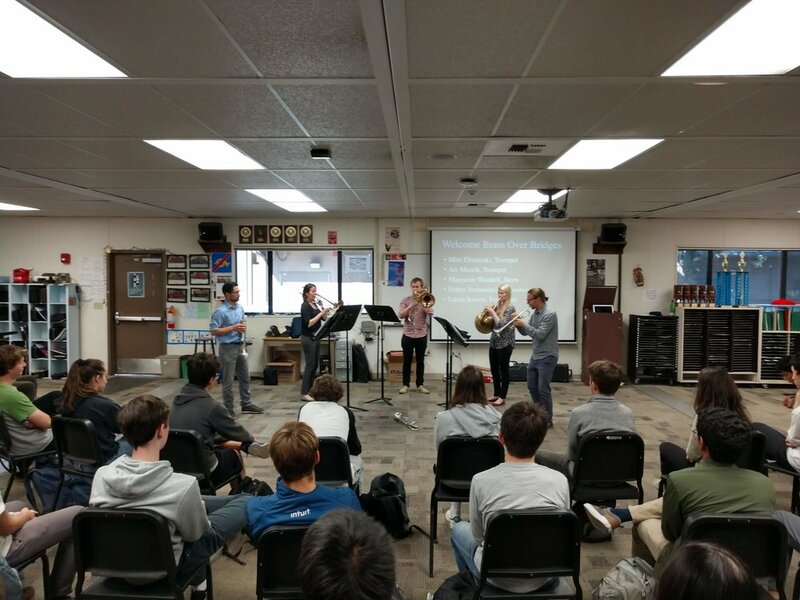 In addition to performing concerts, Brass Over Bridges is passionate about supporting school music programs through outreach performances designed to educate and inspire young musicians. Ari Micich has held positions with the KwaZulu Natal Philharmonic in Durban, South Africa and the Berkeley Symphony. He has performed with the San Francisco Symphony and many other Bay Area orchestras. Ari has performed at Carnegie Hall, the Kennedy Center and toured internationally to France, where he performed for Nelson Mandela's ninety-fifth birthday celebration. In addition to playing classical music, Ari enjoys playing Jazz, writing music and teaching. A Bay Area native, trumpeter Matthew Ebisuzaki received his bachelor’s degree from the Curtis Institute of Music and his master’s degree from the New England Conservatory. An avid classical performer, he has performed with the Boston Pops as well as members of the Philadelphia Orchestra, Cleveland Orchestra, and Boston Symphony and is currently Principal Trumpet of Santa Cruz Symphony. Matthew performs regularly in the Bay Area and enjoys working on musical projects that push outside the boundaries of normalcy. French hornist Margarite Waddell is an active freelancer and passionate educator. She was part of the San Francisco Symphony’s Adventures in Music program, where she performed for all of the first and second graders in the SF Public School District with her trio, Oak Street Brass. Margarite has played with groups including the Stockton Symphony, Vallejo Symphony, Santa Cruz Symphony, Redlands Symphony, Eugene Symphony, Oregon Mozart Players, and spent a year as the Assistant Principal Horn with the Rogue Valley Symphony in Oregon. Notably, she appeared as a soloist with the Silicon Valley Philharmonic last year. Margarite received her MM from the San Francisco Conservatory of Music. Esther Armendariz is principal trombonist with the Santa Cruz Symphony and 2nd trombonist with the Stockton Symphony. She frequently performs with other orchestras including the San Francisco Symphony, the Colorado Springs Philharmonic and the Jalisco Philharmonic. Committed to helping students achieve their personal best, Esther teaches lessons to all ages, and is the trombone instructor for Young Musician's Choral Orchestra. She holds degrees from the San Francisco Conservatory of Music, and the University of Southern California. Originally from Washington state, Lucas Jensen is an active local bass trombonist and graduate of the San Francisco Conservatory of Music. Before moving here, he received his Bachelor of Music from the New England Conservatory. He subs regularly with the Spokane Symphony, and plays with orchestras and chamber groups throughout the Bay Area. As a teacher, he works with several schools in Mountain View, teaches privately, and has worked with the San Francisco Symphony’s Education Department through their Adventures in Music Program. "...you all were really fantastic. Great on all accounts, your group's musicianship and insightful feedback was the best my students have received since I have been here." To book our ensemble and with any questions you may have. Brass Over Bridges performs across the entire SF Bay Area. Thank you! You will hear from us within 24 hours about your inquiry. If this is an urgent, next-day request, please leave a voicemail at 415-613-9466.